Pipkins are ceramic items used as saucepans and made an appearance at the end of the thirteenth century. 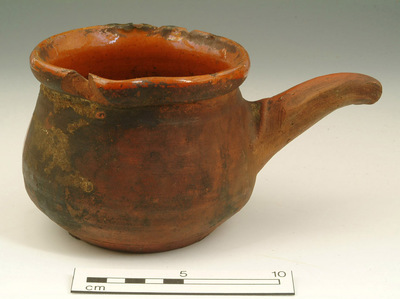 The pipkin consists of a round bowl, with a hollow handle coming off of one side which is angled slightly upwards. Pipkins were an everyday item used for cooking and for storing food; to use it, a person would place the pipkin on top of hot coals in order to heat the contents. It is said that the round shape of the bowl could be representative of a woman's womb, and thus the pipkin could have symbolized fertility and good fortune. 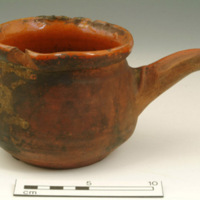 “Pipkin,” Medieval London, accessed April 22, 2019, http://medievallondon.ace.fordham.edu/items/show/26.